The Foodies continued our search for a really good Australian meat pie and sausage roll at Snows’. Once again it was quite competent but LA-based Bronzed Aussie still ranks best. Lunch today cost Au$9.10 per serve, or US$6.65. It turns out that Foodie Greg’s school friends overlap with friends of Foodie Philip from years past, so dinner was organized. After socialization and a swim, we sat down for steak and mushrooms from the grill, with Nigela Lawson’s watermelon salad, and a tomato and corn salad. 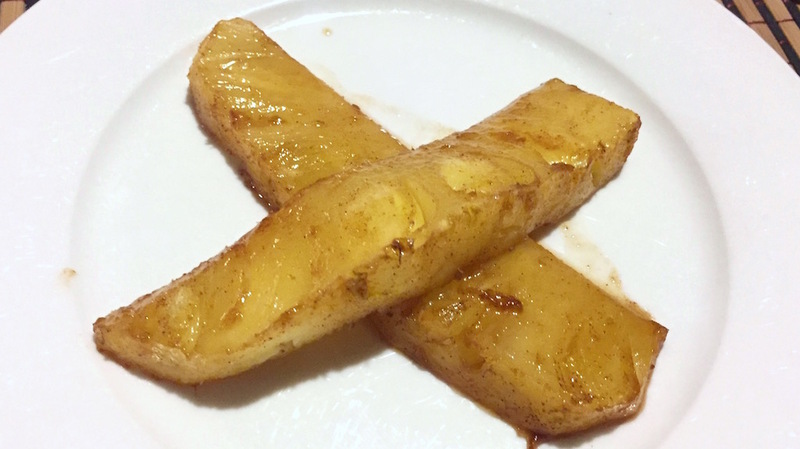 Dessert was pineapple grilled with cinnamon and sugar, and is today’s featured image. The food was great, the company even better. Our hosts covered the cost of the food. Back down to Warner’s Bay for another Kebab before we headed off for a drive to Maitland. The Au$8.00 Kebab is US$5.85. Back to our brother’s place for a steak and salad dinner. He’s not an adventurous cook or eater, but does do know how to cook a steak. For lunch the Foodies were invited out by Foodie Greg’s family and we met at the Belmont 16′ Club. The concept of a working man’s club as it is in Australia doesn’t really translate to the US context. These are member owned, licensed premises supported by ‘poker’ (slot) machines. They would be close to a very small scale casino without accommodation. Foodie Greg had a good Thai steak salad while Foodie Philip had a roast chicken breast with mushroom risotto. Foodie Greg’s family paid for lunch. 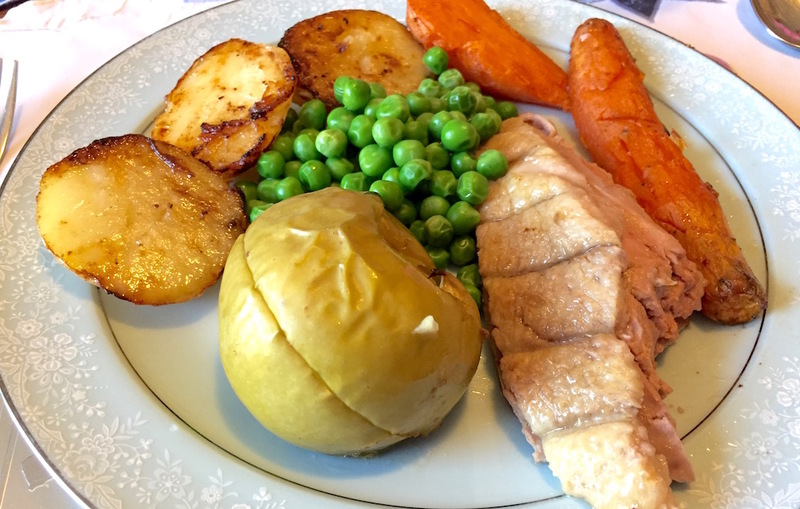 The Foodie’s mom had purchased two fresh ducks for post-christmas celebration and roasted one last night, along with roast potato, sweet potato, apple and carrot, served with peas. Peas and carrot add another 30c per serve. Dinner tonight was an excellent example of a roast meal, particularly since the vegetables were roasted in duck fat! At US$4.68 it was very reasonable. A lazy morning and then on to Christmas lunch with our extended family, starting with grilled shrimp (prawns). The main meal followed of ham, roast pork, an avocado, mango, kumato and leafy green salad, gluten free pasta salad and roast potatoes. The Foodies contributed the salad and enjoyed the rest. Impossible to calculate a per-head pricing. After such a large lunch no-one felt like dinner, although we snacked on some biltong that Foodie Greg had bought back with him from his trip to Kalgoorlie. After collecting Foodie Greg from Newcastle Airport, the Foodies followed our niece’s recommendation and found ourselves at a proper, Greek-run, hamburger and take out shop. For whatever immigrators reason, there were a preponderance of Greek-run take-out shops during our youth and young adulthood. We both wanted a real, Aussie style burger and you can see from the image above, it includes a lot of additions you won’t see on a burger in the United States: egg and beetroot in particular, but much more salad than is usual and way less cooked bacon. Cheese would have been processed, (to be authentic) so we skipped that. 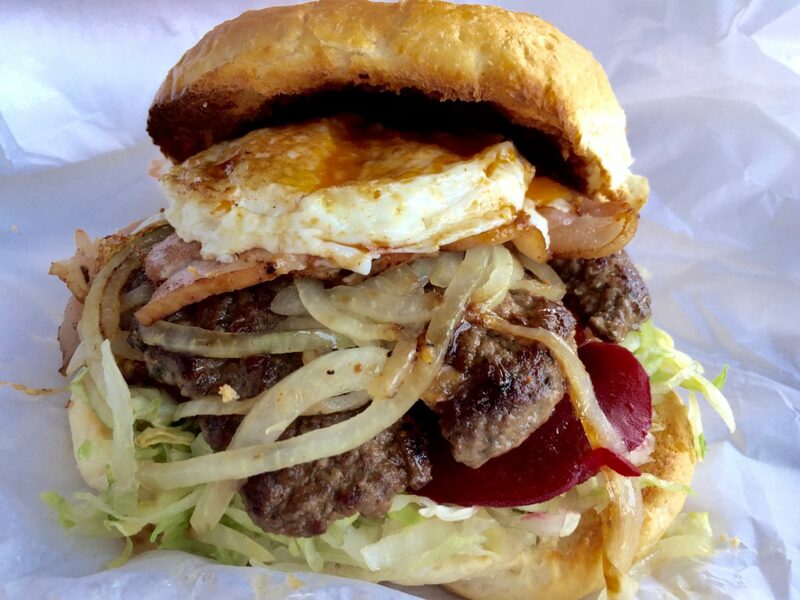 The Aussie Bacon and Egg burger with bacon, egg, grilled onions and salad, with beetroot (a larger version of beets) cost Au$8.00 or US$5.85. As it was our niece’s birthday we took the family to a restaurant chosen by said niece: Parry Street Garage. After just one meal there, it comes with our very high recommendation. The atmosphere modern, converted garage with an open kitchen and limited menu cooked very well. Only one at the table were able to finish the dish because it is so filling because of the faro grain probably, but all – including Foodie Greg – found the combination of flavors worked very well, in an unexpected combination. The pork was perfectly cooked with ‘crackling’ – the crisped skin of the pork belly. (Pork scratchin’s are a very pale imitation.) The crackling was that perfect blend of crunchy, without losing the flavor and texture, and without being too hard. The pork itself had the fat perfectly rendered and unctuous. We assumed that it had been initially souse vidé to cook and render the fat to perfect temperature, and later observed them preparing a pork belly primal for souse vidé. Great to see a restaurant prepare their own food from scratch when so many rely on big food service vendors for the basic preparation. The unctuous pork belly with perfect crackling. While the pork was definitely a 10/10 dish – it’s hard to imagine how it could be improved – the rest of the dish didn’t do the protein justice. The pork really needed something a little acidic to balance the fat: something pickled perhaps, or ceviche onion, or a tart apple sauce (green apple and verjuice compote?). The potato and greens were serviceable, but uninspired while the apple and fennel puree only occasionally had an apple hit. As a dish, probably 7/10 but the pork… Perfect. The average of the two dishes was a very reasonable Au$22.25 or US$16.25 all up. The final bill for the entire meal, with wine and beers, was very reasonable and much less than was expected. Heading out for singing practice and an explore of some local bush and beach locations, Foodie Philip turned back to the kebab shop in Warner’s Bay, which was eaten by the lack. Philip’s sister-in-law prepared a personal favorite: egg and bacon quiche, served with a lettuce, tomato and avocado salad, which was pretty good. 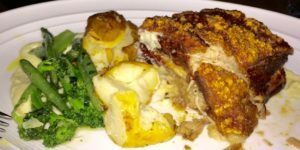 What made it interesting is that the crust was made of thin cut, pre-fried potato draped into position as Philip’s brother is gluten intolerant. It’s a great variation and probably better than the traditional crust. Dinner was compliments of the family. Foodie Philip decided to explore his home city as if it were a place visited for the first time, which naturally included the Harbor Foreshore. 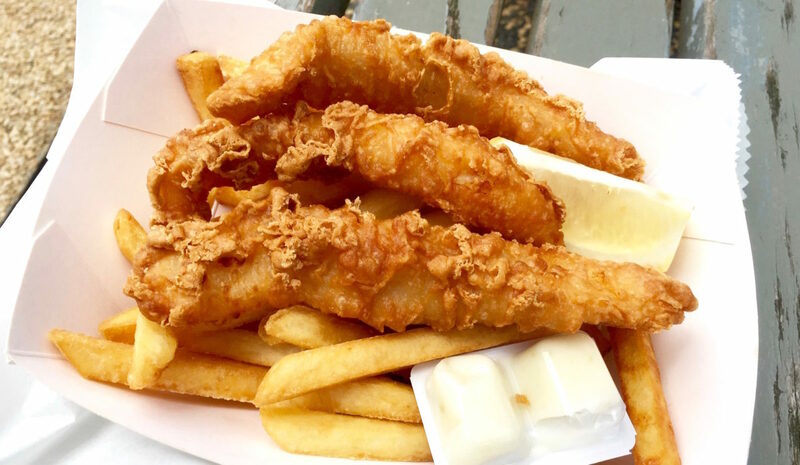 Fish and Chips on the Foreshore seemed like a good idea, and the take out window of the renowned Scratchley’s restaurant provided a good example for Au $12.50 or US$9.13. Foodie Philip’s brother took the family out to a local Italian restaurant, a great example of small neighborhood Italian. First choice Bolognese (you can judge an Italian restaurant by the Bolognese) was sold out, but the Penne Boscaiola was pretty good. Dinner, again, was covered by the brother. The intention was to find a steak sandwich for lunch, but the place recommended was no longer there, so it was back to the schnitzel place for a works: big schnitzel, bacon, two eggs and salad. This was one seriously big wrap at 14″ long and nearly 3″ in diameter! Almost too much food. Almost. Today’s even bigger wrap was Au$12.50 or US$9.12. For dinner tonight Foodie Philip’s brother defrosted some home-made Bolognese sauce with spaghetti, which was pretty good. Dinner tonight was provided by Foodie Philip’s brother. While heading for the kebab shop a few days ago the Foodies noticed that a schnitzel wrap shop seemed very popular. It was crowded while the regular take-out shop two door down, in a corner position, was empty. Foodie Philip had to return and find out why, and today was the day. The servings are huge! An 8-10oz schnitzel in a huge pita bread with the salad of your choice. Today’s option was a Caesar interpretation with bacon and parmesan cheese with a bland dressing, but overall filling and tasty. The size of the serving makes it very popular with tradesmen. Lunch today cost Au$11.50 or US$8.40, which represented good value, although somewhat expensive. Foodie Philip’s brother served lamb loin chops, with an avocado, tomato and iceberg salad. Lamb loin chops are relatively common in Australia – as are all lamb products – but rare in the US, so it was quite a treat. Particularly since Foodie Philip’s niece opted not to eat her chops, which got shared among the other eaters. Dinner tonight was covered by Foodie Philip’s brother. Before traveling Foodie Philip’s hosts made a ham salad sandwich. This week Foodie Philip is staying with his brother while Foodie Greg is on the other side of Australia with his sister. Brother cooked Rib Eye Filet with garden salad. Neither meal cost anything out of pocket.